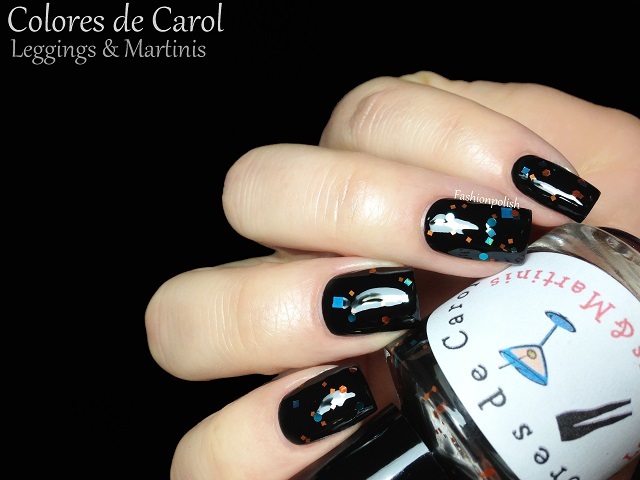 Fashion Polish: Colores de Carol Girls Night Out Collection & bonus : It's Raining Hearts! 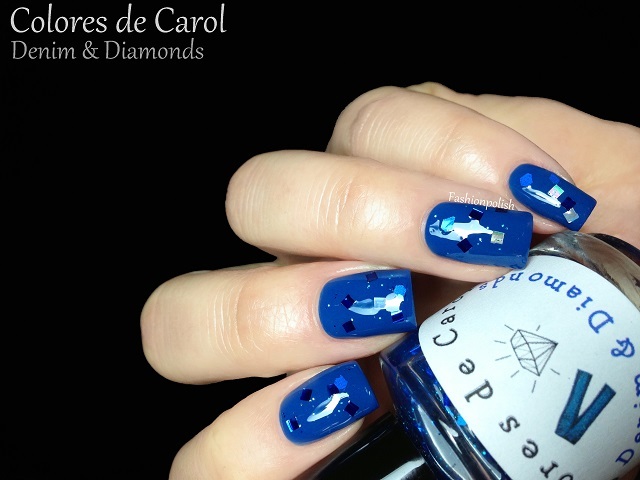 Colores de Carol Girls Night Out Collection & bonus : It's Raining Hearts! I hope you're all having a great week so far! Here it's been snowing like crazy and I haven't been able to go to work for 2 days! It would probably have been a fun if I could have spent my days swatching or even procrastinating and watching tv series... I wish! 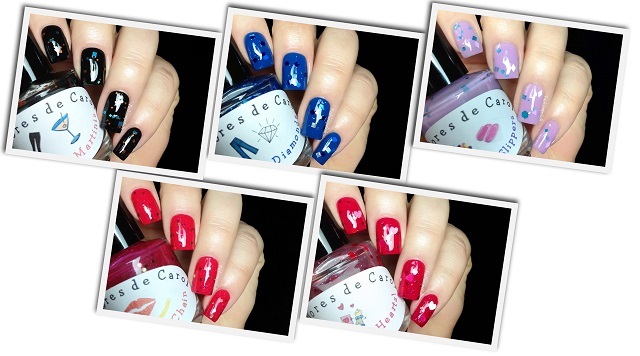 Anyway, today I have the very first Colores de Carol collection to share with you, Girls Night Out as well as It's Raining Hearts! from her V-Day collex. If you're unfamiliar with Colores de Carol, Carolina, the owner, is a fellow nail blogger and runs the namesake blog (link inside). 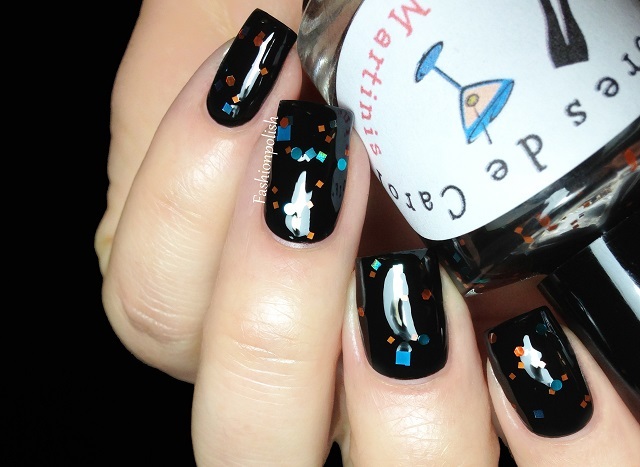 Leggings & Martinis is a black jelly with a mix of turquoise and orange glitters in various sizes of dots, hexes and squares. It's really unusual but being a sucker for black, of course I love it! I think it would reach full opacity on its own at 3 coats but I wanted a more intense look so I layered one thickish coat of Leggings & Martinis over black below. 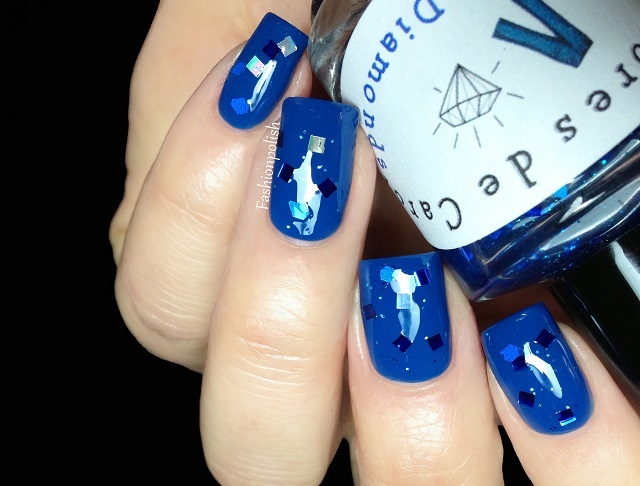 Denim & Diamonds is a sapphire blue tinted base with blue squares, hexes and micro glitters but also HOT silver holographic squares! This one is meant as a topper so I applied it over Essence The Boy Next Door and I really love them together. One thickish coat plus topcoat here as well. 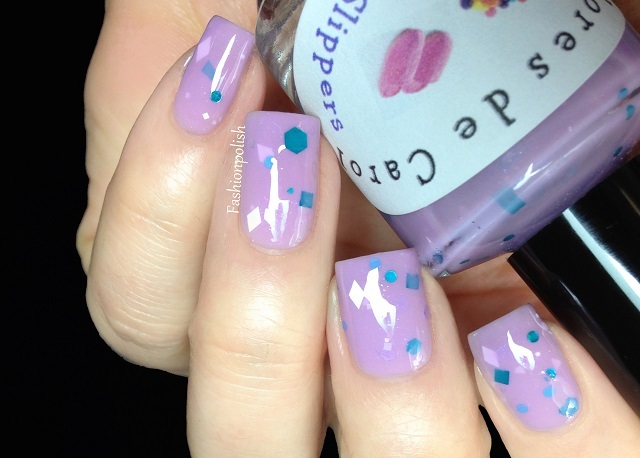 Bubblegum & Slippers is a light purple with turquoise and white glitters in lots of shapes and sizes : hexes, squares, diamonds,... It's actually the first one I swatched and the only one I used on its own. As you can see below, it reached full opacity with 3 thin coats. Red Lips & Gold Chain is another tinted base : red jelly wih red and gold glitters. There's just something about reds with gold glitter that makes me want to own them all! One thickish coat over Nicole By OPI Please Red-cycle in the swatches below. And finally It's Raining Hearts! 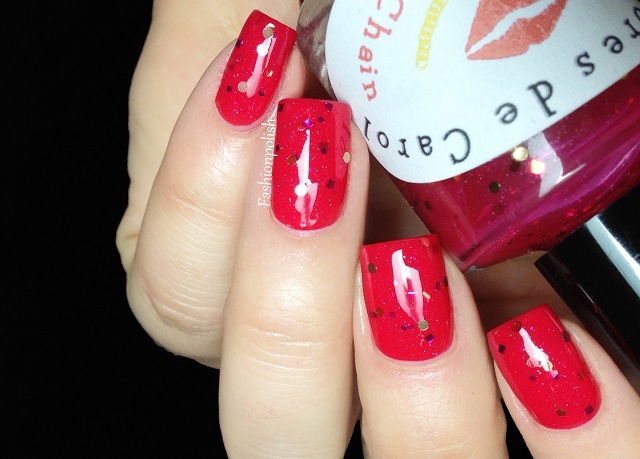 from the Colores de Carol Valentine's Day collection is a mix of pink and red glitters in a clear base. It's very girly, with the hearts and all but I still love it over red somehow. This is one thickish coat over the previous shot, plus topcoat. I love the concept of the Girls Night Out collection and I think that these all look great together! I had some fishing to do for the larger pieces of glitter but I managed to dig them out rather easily. Carolina has changed supplier for her suspension base ever since she sent me those so you shouldn't experience the same issue with your purchase. In conclusion, I'll just say that they all make good toppers and I can't wait to see what Carol comes up with next! Colores de Carol is available is available on Big Cartel and retails for $9 each. Carol also has a few listing with minis, special deals on full collection and/or limited editions such as It's Raining Hearts! ($7 instead of $9) as well as a special coupon for all Fashion Polish readers!!! Oh and don't forget to check out her completely revamped bottle design! So cute!!! For more information, please refer to Carol's blog coloresdecarol.com or to Colores de Carol on Facebook. Thank you very much Sam for taking your time to review my polishes. Your swatches are perfect! IKR? I LOVE black polish! I super love the leggings and martinis and the raining hearts. I find them so pretty and classy. They are perfect for evening parties or special occasions. Beautiful polishes & perfect swatches Sam, but such a shame they can't be shipped to the UK :-( , I'd have all of them otherwise!